Christmas may be over, but we just got our first real “break out the boots and snow shovel” snow. Kids were out of school, the whole shebang. You can try though! I believe in you. I have saved the photos until now to keep you in suspense! Just kidding. I didn’t want to jump the gun because I didn’t feel like the tree was finished. Which it wasn’t, as I kept finding nice things to add to it until just a little bit ago. Now it’s finished and ready for a reveal. 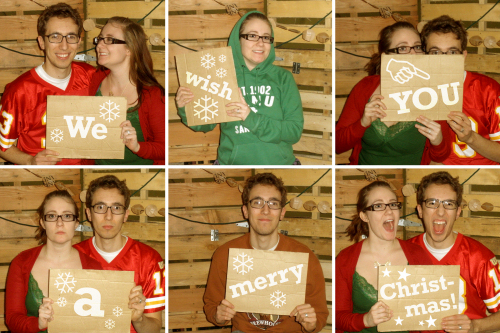 I was going to post this on Friday, Christmas eve, but then I thought people might not be at their computers obsessively checking my blog that day. So now’s as good a time as any to share the festivities with you! Here she is, in all her 3-foot glory. We set it up on our record album cabinet and used a set of curtains that came with the apartment (that I’d changed out but kept for just such an occasion) for a tree skirt. Oh and there are the presents that have been 75% distributed. Doesn’t look so crowded down there now. Okay, time for some detail shots! 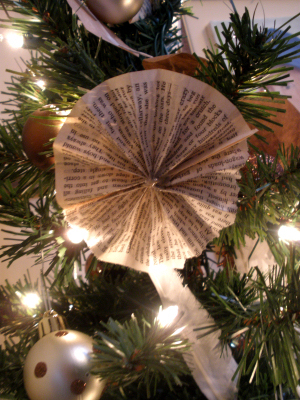 Paper fan ornaments I made out of an old book... I made about 5 or 6 of these. 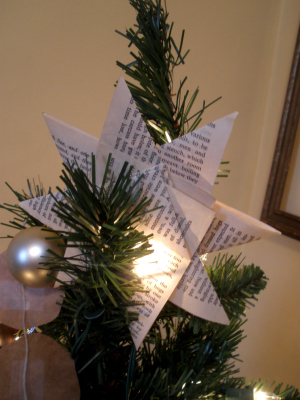 Using the same book, I made a star for the top of the tree. 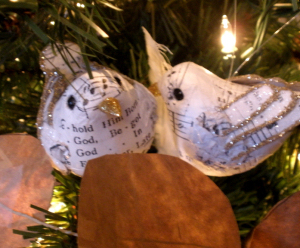 These are our "love birds" (purchased at Target for $1 each) for our first Christmas together. 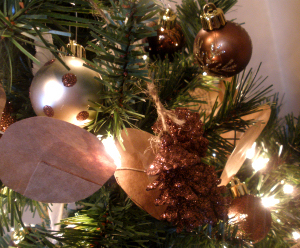 Cue "Awww"s.
The most expensive ornaments on the tree... pinecones. 2 "bunches" for $10 at Dillard's. The balls were $5 for a box of 20 at Target. Additionally, those who pay attention to detail may recognize the paper circle garland from the backdrop of our Christmas Card photos. 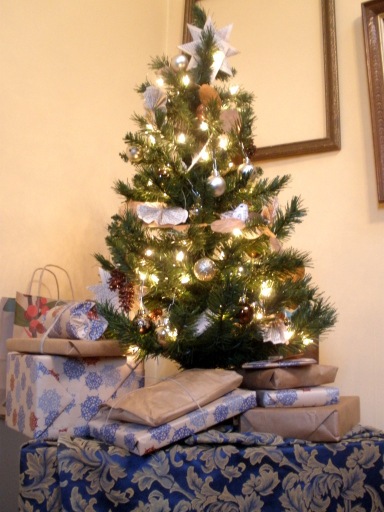 All in all, the tree and ornaments came in at around $35. Not bad, and pretty classy if I do say so myself.